Jaipur was and remains the only city in the world, symbolising the nine divisions of the universe, through nine rectangular sectors sub-dividing it. Jaipur is a royal city & this is its most noticeable aspect, small buildings & festivals testify it. Jaipur & its surroundings are rather like an endless museum. The city also offers an endless variety of crafts. Jewellers here still fashion the beautiful enamel-on-gold pendants, studded on the reverse with precious stones or pearls & turquoise that one sees in miniature paintings. Jaipur's lacquer bangles are famous all over the world. This is a city to be visited. The City Palace : In the heart of the old city is former royal residence built in a blend of the Rajasthani and Mughal styles. The carved arches are supported by grey-white marble columns ornate with floral motifs in gold and colored stones. Two carved elephants in marble guard the entrance. The retainers whose families have served generations of rulers serve as guides. The palace houses a museum with a superb collection of Rajasthani costumes and armory of Mughals and Rajputs. The palace also has an art gallery with an excellent collection of miniature paintings, carpets, royal paraphernalia and rare astronomical works in Arabic,Persian,Latin and Sanskrit, acquired by Sawai Jai Singh II to study astronomy in detail. Hawa Mahal : The Hawa Mahal, or the "Palace of Wind" built by Maharaja Sawai Pratap Singh in 1799 A.D. is characterised by elaborate and fanciful architecture. The broad pyramidical facade comprises five storeys of semi octagonal overhanging windows with perforated screens, domes and spires. Govind Devji Temple : To the north of Chandra Mahal in the midst of the sprawling Jai Niwas Garden is the spireless temple of Lord Krishna. The idol wsa brought from Vrindavan and installed here by Sawai Jai Singh II as the tutelary deity. Today, the temple attracts devotees, from all over the country. A delightful system of fountains is placed in the middle of the paved path between the Chandra Mahal and the Badal Mahal. The palace has extensive and sprawling gardens. Amer Fort : At a short distance of 11 kms . from Jaipur, the Amer Fort complex stands amidst wooded hills overlooking the Delhi-Jaipur highway, with its forbidding ramparts reflected in the still waters of the Maota Lake below. 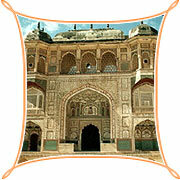 One of the finest examples of Rajput architecture, it was the ancient capital of the Kachhawah rulers. The original palace was built by Raja Man Singh and additions were made later by Sawai Jai Singh. Within the palace are the Diwan-e-Aam or the "Hall of Public Audience", the Diwan-e-Khas or the "Hall of Private Audience" and the Sukh Niws where a cool breeze blows across channels of water for the purpose of air-conditioning. Ram Niwas Garden Central Museum (or Albert Hall Museum) : Situated in the spacious and beautiful Ram Niwas Garden, the museum has a rare collection of art facts and craft items such as metalwork, ivory carvings, cane wood articles and exquisite pieces of jewellery, textile, pottery and paintings. It is particularly rich in specimen of embossed, hammered and chiselled brass wares. The building was designed by Colonel Sir Swinton Jacob in the modern Indo-Saracenic style and was built in 1886 A.D. when King Edward VII visited as the Prince of Wales. 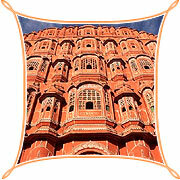 There are several budget hotels and paying guest accommodations available in Jaipur. major gem and jewellery centre, Jaipur is famous for Kundan work (enamel work on gold). Also there are woollen carpets, cotton rugs, marble statuary, enamelled wares, brass ware, hand-block printed Sanganeri and Bagru Cotton fabrics, exotic blue pottery made from crushed quartz, leather footwear and more. Air : Jaipur has its own airport, and is well connected to all other tourist and business centres. Rail : An excellent connection to Delhi by Shatabdi Express and the Pink City Express. Other connections to Jaipur are from Bikaner, Jodhpur, Udaipur, Ahemadabad, Secunderabad and Lucknow. Road : A network of reasonably comfortable tourist buses, run by road corporations of Rajasthan, Haryana and others.